What Educators Are Saying About CREATOMsetgo! "Seeing these tools pulls it all together for me with the design thinking model that allows for the richness, depth, and complexity, and an organizational tool I have not seen in PBL before." "The design thinking process has brought in some structure and more of a process for planning a PBL." "The cards helped me with ideas for different activities so I didn't feel like I was reinventing the wheel." 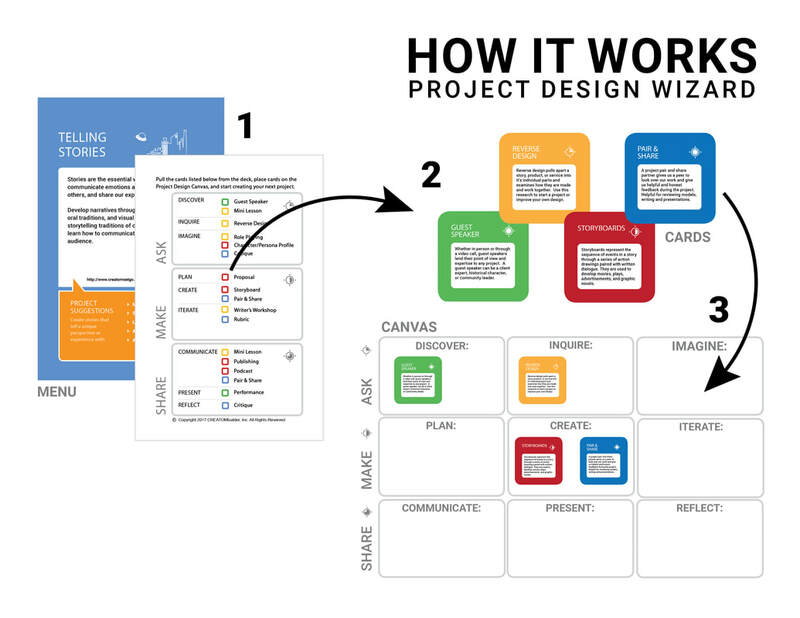 "CREATOMseto provides a blue print and a common language to get started planning projects." "CREATOMsetgo helps us to visualize the task we are going to do and helps us to relate it to the standards we are teaching." "The great thing was the design thinking cards gave us a way to break down the project into tiny deliverables, and helped us better plan how the students were going to engage with the materials." CREATOMsetgo combines the best of design thinking, project-based learning and the maker space: visually guiding you through the same process used by designers and engineers to solve some of the worlds most difficult problems. ​Contact us for questions, workshops, and coaching.